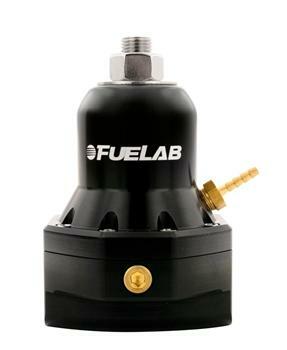 FUELAB 565 Series Fuel Pressure Regulator UNIVERSAL - MiataRoadster - Stay tuned with MiataRoadster! FUELAB 565 Series Fuel Pressure Regulators have all of the same great features as the 515/525 Series except for extreme capacity. Utilizing a massive ½” return orifice and -10AN ports, these regulators hold no bounds. With the bypass capability over 5 GPM at 5 PSI, this new regulator can handle blow through carbureted applications well over 1800 HP, and for EFI applications using belt driven fuel pumps; even further (with a flattened regulation slope). Regulator comes in four different pressure ranges covering applications between 4 and 80 PSI.